If you trade the Emini the Hawkeye KISS gives you a big heads up and saves you a minus trade. Based on all the stock on the NYSE, Nasdaq and Amex the KISS represents if more stocks are being bought or sold, i.e. if the red line is rising it shows that more stocks are being sold across all markets and vice-versa for the green line. 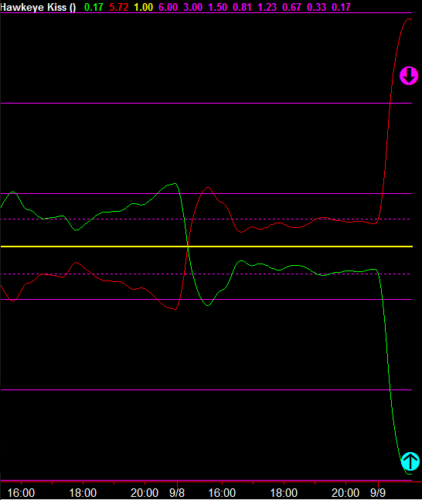 In this example above you can see the 3-minute KISS just starting to show a sideways movement indicating there is a pause, or a possible reversal, in price. The KISS is not showing any buying as it would require the green line to rise with conviction. Let’s now look at the price. Where I have placed the cyan arrow the program indicated a Volume Roadkill long entry, which was not elected. Why? Well lets look at the yellow and red tick speeds. As you can see the Heatmaps (the indicator on the bottom of the charts) are red, and the trend on the price the dots show trend run down. 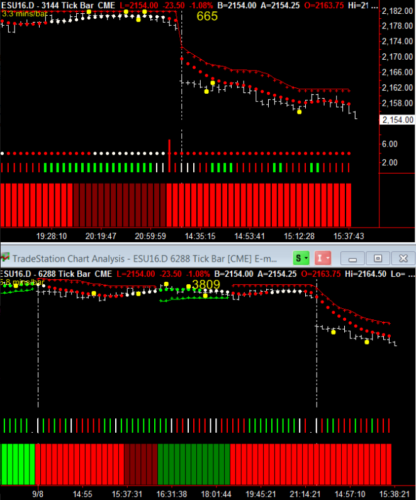 By combining all three tick charts and seeing what the underlying stocks are doing across the exchanges there was FAR too much risk in a long entry off the blue timeframe.